Scroll down for an overview of our products. Purified Tea & Breath Sprays - Our pure essential tinctures taste mild like an herbal tea. Concentrated and purified they conveniently pass through a fine, spill resistant, pump spray bottle. They are great when you're on the go. Our plant tinctures contain the essential oils, extracted minerals dissolved in water, and a small percentage of grain alcohol which preserves the herb using approximately 12.5 percent by volume - 1 spray is approximately 1/5 of a drop of alcohol. Our process is derived from an ancient technique known as Spagyric - Origin: Greek: Spao, to tear open, and ageiro, to collect. It was originally developed by Phillip von Hohenheim, known as Paracelsus, in the 16th Century. Spagyrically prepared herbal tinctures make use of the entire plant and require less material which reduces impact on herbal resources. Oils - We combine pure vegetable oils with herbal essential oils to create a soothing massage and body oil. Our handy roller ball dispenser allows a thin coat of oil and is easy to use on the go. Salves - Our salves are prepared from fine herbs, oils, and organic bees' wax. These come in large and small tins. In late 1994, our oldest daughter, then two and a half years old, contracted her first ear infection. Like a good mom, I took her to the doctor and dutifully started her on the antibiotics that were prescribed to us. After a few days, however, she began to exhibit symptoms of an antibiotic allergy, breaking out in hives. I immediately notified our pediatrician, and we switched antibiotics, as is common practice. Unfortunately, over the next ten days, we discovered that our daughter reacted negatively to each antibiotic group that we tried. We also learned that she was allergic to the antihistamine that I was advised to give her for the hives that she continued to experience. The doctors were unable to give me any useful advice as to how to proceed. I was undeterred. As both a mom, and a nurse, I felt confident that I could educate myself and find some sort of answer to alleviate my child's suffering. I began by researching what doctors in other countries did to treat common childhood ailments. To my surprise, I discovered that, while they do have antibiotics in other countries, doctors seldom use such strong medications as the first line of treatment for a young child with a simple ear infection. Instead, they frequently rely on herbal medicine, often prescribing various teas and herbal preparations in place of antibiotics, with great success. So began my journey. I started with a few simple tea ingredients, using both modern and historical herbal texts as my guide. Within the week, our daughter's ear infection had cleared up completely, with no negative side effects. As Western Medicine lacked an explanation for this, I explored more deeply into the world of herbalism. First I studied by myself. Eventually, I located a distance learning program (snail-mail, in those days) which fit my needs. After a few years, I happened upon a 3 year herbal degree program in my home town of Chicago, and began to pursue my studies in earnest. During that time, while continuing to work as an ICU/ER nurse in and around the city of Chicago, I shared with my family the knowledge that I was gaining. Ultimately, I found that, with little difficulty, I was able to make most of the home herbal first aid and wellness items that any average family might need. 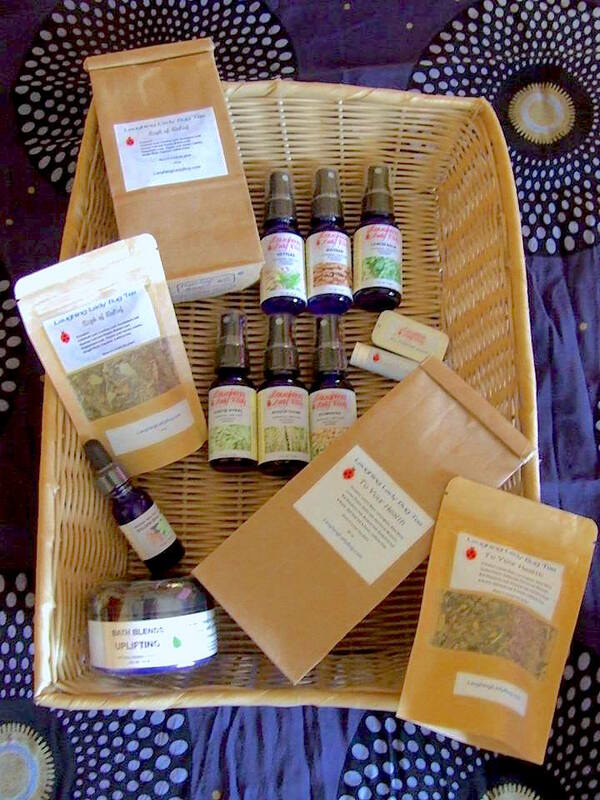 In early 2004, after sharing my home-made teas, crude tinctures, and salves, with interested friends and family for several years, I began working with my friend and alchemist, Timothy A. Wilkerson. He was able to take several of my formulas and make them into spagyrics. To my delight, I learned that spagyrics are easier to use, with far less alcohol by volume than a crude tincture, a plus when working with children, the chronically ill, or the Elderly. Similar to a crude tincture, but more complete and more effective, spagyrics also require less raw plant material, appealing greatly to my sense of conservation when it comes to using At Risk and Endangered medicinal plants. By June of that same year, Laughing Lady Bug Botanicals was born. Each of the products that we make, by hand, in small batches, exists because my own family had some need or other. Indeed, every one of our recipes has a personal story much like the "To Your Health" tea, as it is now called. Our ingredients are chosen specifically because they are mild, and least likely to interfere with OTC or prescription medications. While we do always recommend that our customers review our ingredient lists in order to determine if a chosen product is right for them, I like to joke that, "If your dog or your baby accidentally eats the whole thing while you are not looking (as dogs and babies sometimes do), it will not cause harm." That being said, please do remember that herbs are still medicine and should be approached with knowledge and treated with respect. Please feel free to contact us with any comments, concerns, or questions. 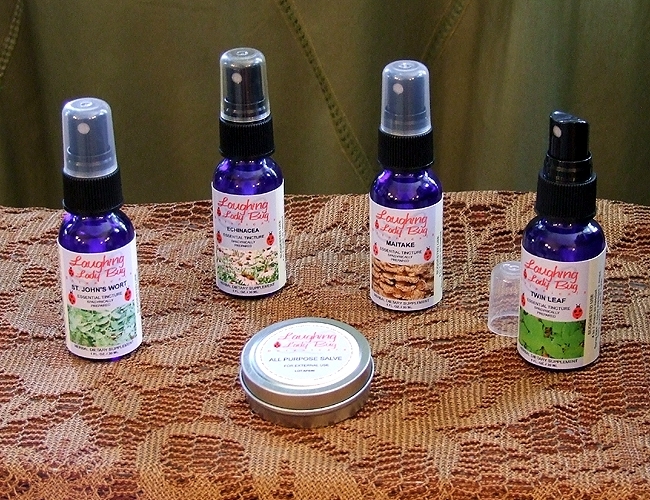 Please note that Laughing Lady Bug Botanicals does not diagnose ailments or offer treatment suggestions. We are dedicated to providing simple, affordable, complete, herbal wellness formulations that can be used with confidence by the discerning consumer. DISCLAIMER: Laughing Lady Bug Botanicals is not engaged in rendering medical advice or professional services. Products available at this site are not intended as a substitute for the diagnosis, treatment and advice of a qualified licensed professional. Always see your practitioner if suffering an illness or accident concerning your treatment options. No warranty or guarantee of a cure is expressed or implied with any of the products on this site, nor does Laughing Lady Bug Botanicals make any representations regarding the use or the results obtained with these products. In no event shall Laughing Lady Bug Botanicals, its employees or associates be liable to any person, agency, organization and the likes of such parties for any loss or damage whatsoever which may arise from the use of the products advertised on this site. The herbs contained in our products may not been evaluated by the Food and Drug Administration. Midwest Herb Fest! & Herbal Education Inc.